Fire is a gift that is often taken for granted… until you NEED it. Fire making without matches or lighters is a skill that has largely been forgotten in modern Western culture. In my quest for self reliance, I have undertaken to learn alternate methods of making a fire. It is my passion. I have developed “Ken’s five fire catagories” in which all created fires fall. These catagories are: Friction, Percussion, Optical, Electrical, and Chemical. 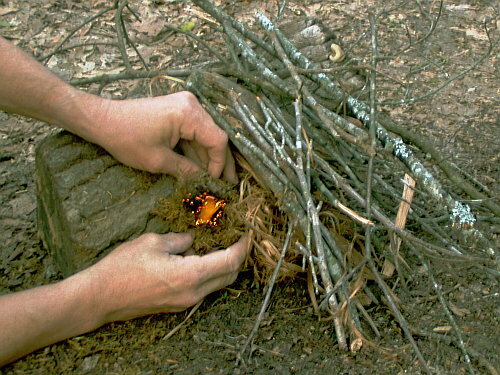 The following fire methods describe how to make fire without matches. 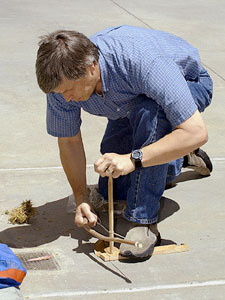 Friction methods results from a surface rubbing against a surface, usually by rotational or linear means. fire pistons. It’s really related to friction, but usually achieved in an instant. Watch my video using ferrocerium in a empty lighter, and a video using quartz and steel. Optical means that light is focused to a point of intense heat. We are familiar with magnifying lenses, but alternate means can acheive the same effect. Generally there are two ways: concave or parabolic reflective surfaces such as bowls, reflectors, and mirrors; lenses – whether solid or liquid filled. Electricity is used for ignition by a point of extreme heat. This can be a hot element on tinder, or it can be a spark to ignite a fluid or gas. Watch my video using a microwave oven to create a flame. The chemical reaction known as exothermia raises the temperature to a point of combustion. this can be immediate, in minutes, or hours. Fumes from chemical reactions can be deadly and should be conducted outdoors. If you have read any Camping or Outdoor Living books, you’ll probably run across the different ways to build a campfire. These styles may include… pyramid, star, teepee, cross-ditch and more, but I prefer the lean-to approach. What I appreciate about the lean-to is that it is stable and can double as a wind screen to protect the initial flame. It takes very little preparation to build. In addition, the larger sized fuel that supports the structure is heated up right from the start so that it catches fire faster for a stable, longer burning fire. 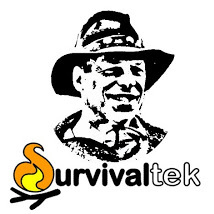 For more details, check out my blog on How I Build A Campfire. curl of plastic you put in the top of the little candle? Because in the movie the fire start as a spark between the two ends of the strange string you put in the top of the candle. The “little curl of plastic” is actually a plastic coated piece of wire that is used to secure the end of a bread bag. I can’t technically explain the discharge process, but electricity tends to be attracted to sharp points, like the lightning rods that you see on the top of buildings and tall structures. A paper clip or safety pin can be used in a similar fashion with tinder placed between the two points. I’m eagle scout and have an appreciation for being prepared for any situation. I’ve used one or two of these methods in the past and understand that it is good to be well versed in all of them. However is there one method that you would endorse more than the rest. Is there a “Best” fire-starter to carry and one that you’d personally rely on more than the others? Something that you’d carry on you everyday/have in a survival pack? Thanks for the research and passion. Usually I carry several ways to start a fire… a wallet magnifier, ferrocerium stick, butane lighter and a knife for whittling a kit. You can be sure that primitive man would have used modern-day fire making tools if they had been available. If I were to go on an expedition, I would want to take a stout ferrocerium stick as my main reliable source for fire. Be sure to practice with it NOW so that you know how to use it when you need it. For CONVENIENCE, I would use a flintwheel butane lighter, knowing that it doesn’t perform well in fridged conditions and it would eventually run out of fuel, but in the end you could still use it’s sparking capability with fine tinders and highly flammable liquids. 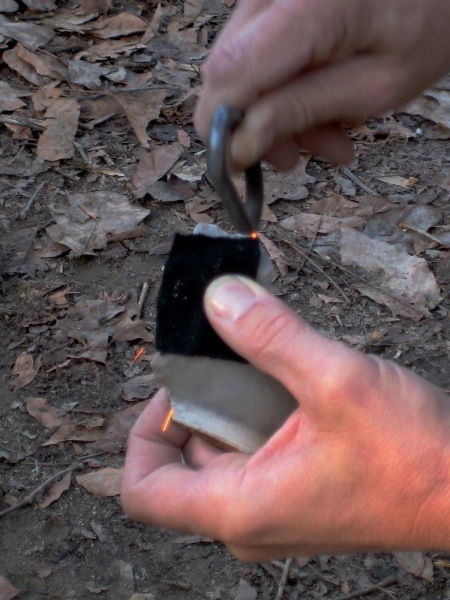 Packing a fire starter always just makes sense. Our favorite is the one I started making in Boy Scouts – the paper egg carton with its cups stuffed with tiny twigs/shavings/chain saw chips/etc and filled with melted wax. Make sure the wax is hot enough to “wet” the paper carton and that will keep the carton from getting wet. 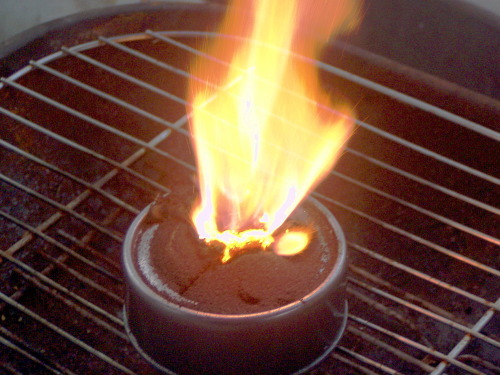 When cold, you have a dozen easily separated, clean, waterproof, easily lit, 5 minute hot burning fire starter. This starter can be bounced around in the bottom of your pack, leave nothing but wax smudges on the fabric and be ready for immediate use. For a cheap fire starter, I take expired antibacterial ointment (which is primarily petroleum jelly) and use it to saturate dryer lint. It works great, burns long and hot, and a little goes a long way. I’m not sure how well it starts with just a spark wheel, but I’d guess magnesium and ferrocerium would start it just fine. I carry it along with matches, lighter and magnesium/spark in my backpack for those Murphy’s law situations, or when I’m tired and don’t feel like building a one match fire. Fire is [often] underestimated by people. They think it is only for cooking, heat etc. But fire and creating fire is much more than that. It is science all by itself. I listen to all these efforts to make fire with sticks. The easy way that saves time and energy is a BIC lighter that you can pick up for 5 for $3.00. 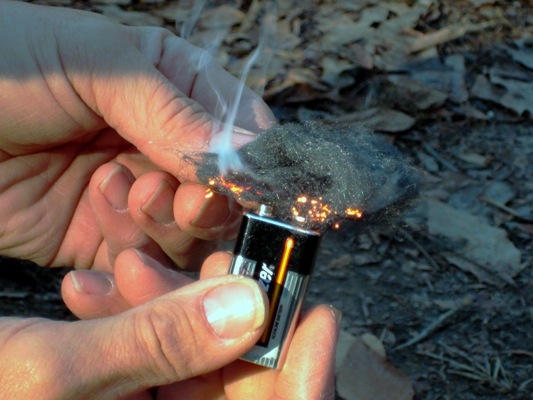 I agree… that IS the easy way, but what if there were no bic lighters available? What if you had no matches? Until recent history, these primitive fire methods kept mankind alive. I know a skill to make fire by a battery and a lamp. Maybe you don’t know Chinese.But you can learn this skill by images.If you have good survival skills I hope you can share with me.Thanks. It’s great to meet a kindred spirit firecrafter. Thanks for sharing your link! just a question on fire piston categories. Surely that would be under compression and not related to friction and percussion? Compression is the action but the friction of the compressed air ignites the tinder. Interestingly, percussion is actually friction in an instant, much like a fire piston.